This guide assumes that you have at least basic understanding of what a domain, DNS, SPF and DKIM are. If you're not sure what they taste best with, please take a moment to read about them, following the links for each. Primary domain is the one you use on a daily basis to send business emails from Woodpecker (for example, customer-success.us). When using Sendgrid, it’s better to come up with a subdomain (for example, m.customer-success.us), and set it up in Sendgrid settings. This will also require you to set up the subdomain in your DNS settings panel. Before you start using Sendgrid to send your emails, it’s crucial to have a properly prepared domain. We recommend using a separate domain for cold outreach, so if you don’t have one yet, set it up. Choose whatever domain registrar and/or DNS server you prefer. Configure your DNS and take some time to warm up the domain before sending your cold emails. Once your domain is ready for sending emails, you can set it up with your Sendgrid account. Also, note that Sendgrid gives quite fresh IP addresses that also need to be warmed up first. To start with, you will need to create a subdomain in Sendgrid. You can do it in Settings -> Domains -> New Whitelabel. To create new domain white label add a prefix in the Subdomain field and provide the name of your domain in the Domain field. Please remember that the subdomain address will not be visible to your prospects. You will use it just for Sendgrid to make sure your domain is safe and your deliverability rate stays high. After you create a subdomain, you will see the DNS records that you will need to add to your domain settings. If you have an SPF record set for your domain, you just add include:sendgrid.net to the record in your DNS in domain settings. Fill in all the data and click on “Add record” to save the record for the subdomain. The next step is to set up CNAME records in your domain settings. Go to your DNS settings and define a new CNAME record for your subdomain. Please copy and paste the data that SendGrid will provide you with. The next step is to go to Sendgrid and validate all CNAME data that you’ve just set up in your domain settings panel. If you did everything right, you’ll see a green mark next to it. Choose your email provider or click ”Other (IMAP)”, and then select the option Advanced - I want to use another SMTP server. Firstly, you need to connect your IMAP. To do this please fill out all empty fields. For connecting SMTP you will need an API KEY from Sendgrid. You can create it in API Keys -> Settings. To create an API key, you will need to provide API Key Name. It’s the name of your subdomain. 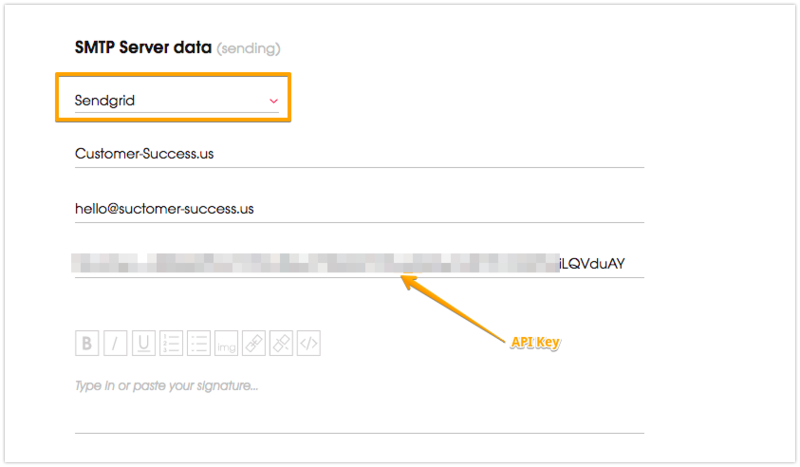 Please remember that Sendgrid will generate and show an API Key for you just once. In case you don’t copy it, you will need to create it again. Provide the API Key from Sendgrid to Woodpecker, after choosing Sendgrid as the SMTP service in SMTP settings in Woodpecker. If all data provided in SMTP settings in Woodpecker is valid, you’ll get a notification about successfully connecting your email address to Woodpecker, Sendgrid included.